Long Term Equestrian Development (LTED) is a framework for the development of programs in every stage of coach and athlete development. These programs are athlete-centered, coach-driven and supported by an integrated sport system. This roadmap provides a clear age and stage appropriate pathway for success whether it’s a child or adult wanting to learn how to ride, an athlete on the verge of high performance or an individual or family participating for the pleasure of being with their horse and involved in the equestrian world. The Quest for Gold: Ontario Athlete Assistance Program (QFG-OAAP) is a program funded by the Ontario Ministry of Tourism, Culture and Sport (MTCS). Quest for Gold’s overarching goal is to improve the performance and number of Ontario athletes competing at the highest national and international levels, contributing to the improved performance of Canada at international competitions. The program supports Ontario’s amateur athletes through direct financial assistance, enhanced coaching, and enhanced training and competitive opportunities. 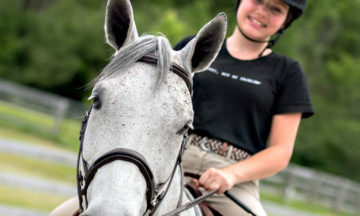 This program funds up to 10 Ontario Equestrian athletes between the ages of 11 and 35 in the 3 Olympic disciplines including Show Jumping, Eventing and Dressage, as well as Para-Dressage. Athletes are invited to apply and selections will be made by the Ontario Equestrian Quest For Gold Selection Committee. The deadline for receipt of the 2018-2019 Quest for Gold application is January 29, 2019 at 12-Noon. Created as part of the Young Riders Development Program, the U25 series was introduced to increase participation and improve performance at the FEI Children, Junior and Young Rider level. Athletes between the ages of 16 and 25 are eligible. By providing youth with a pathway to become involved in the sport of jumping from an earlier age and to pave the way for a strong pool of future Canadian Equestrian Team athletes to represent Canada on the world stage. Explore more about the U25 Program Criteria on the Equestrian Canada Website.